Throughout my experience as a teacher, I have found that classroom management styles reflect the students who are being taught; the classroom rules change according to the students' needs. 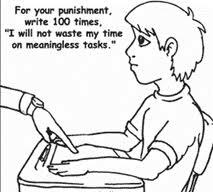 Mendler states that "effective discipline really means teaching kids how to become responsible" (33-34); classroom management establishes the ground rules for allowable and non-negotiable conduct in the classroom. With one of my smaller classes, I was able to have Socratic seminars in a small circle; the students came up with the questions and posed them to one another. I acted as a moderator throughout the discussion because I knew that my students respected one another and that they would not disrupt each other. In one of my larger classes, I had to create an "inner" and an "outer" circle of desks. I had the students prepare for the discussion by having them answer pre-Socratic seminar questions that we came up with as a class; the "inner" circle discussed the questions while the "outer" circle made notes on their questions sheet about what their classmates were talking about. After ten minutes, the "inner" circle kids moved to the "outer" circle and the "outer" circle kids moved to the "inner" circle. This allowed the students who had taken notes to discuss the problems or questions that they had discovered from the prior conversation. I had to change the rules between the two classes because I knew that I had to treat the students fair, but not equal (Mendler 39). I had behavioral problems with my second class as well as problems with attendance and etiquette when others are speaking. The second Socratic Seminar had to be more structured to meet the needs of the class so that all of the students had an opportunity to participate and have their opinion heard without interruption. I was much more involved with the discussion of the second class so that the class stayed on task. Brophy, Jere and Carolyn Evertson. Learning from Teaching: A Developmental Perspective. Needham Heights, MA: Allyn & Bacon, 1976. Print. Mendler, Allen. What Do I Do When...? Bloomington, IN: Solution Tree, 2007. Print. Wong, Harry and Rosemary Wong. The First Days of School. Mountainview, CA: Harry K. Wong Publications, 2009. Print.